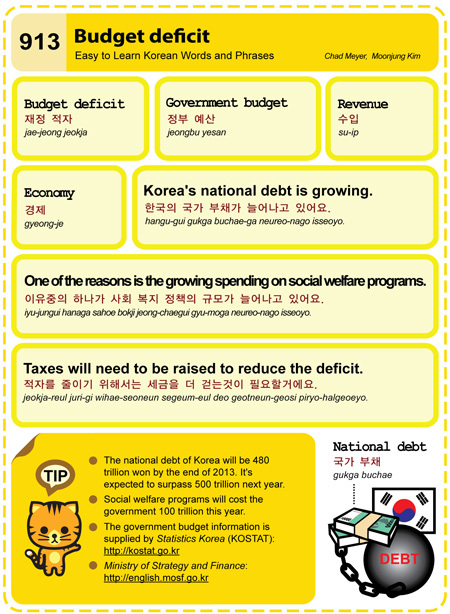 Easy to Learn Korean 913 – Budget Deficit. This entry was posted in Series and tagged budget deficit, economy, government budget, KOSTAT, Ministry of Strategy and Finance, national debt, reduce the deficit, revenue, social welfare program, taxes need to be raised, 경제, 국가 부채, 수입, 이유중의 하나가 사회 복지 정책의 규모가 늘어나고 있어요, 재정 적자, 적자를 줄이기 위해서는 세금을 더 걷는것이 필요할거에요, 정부 예산, 한국의 국가 부채가 늘어나고 있어요 by easykorean. Bookmark the permalink.